Isn't this one of the cutest stamp sets you have seen? I just love it. Check out my card below! 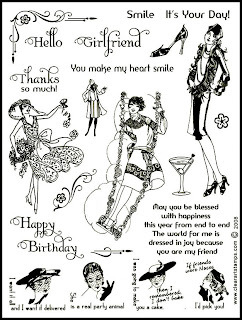 Glamour Girls has 21 separate art deco inspired stamp designs in large to small inchie size. This stamp set has both designs begging to be colored and also perfect for the ‘bold black ink on pink’ glamour girl style that’s so popular! The words and sentiments are a mix of warm and funny greetings that will have your girlfriends smiling. Dress up cards, tags, gift packaging, albums and more. This large stamp set sells for $24.95 plus shipping. Please e-mail me if you wish to purchase this set and give me your preferred method of payment. I accept Visa, Master Card and PayPal. I also need you zip code to determine the amount for shipping.